Ramphastos toco Mueller, P.L.S., 1776. The genus Ramphastos includes the largest members of the toucan family. 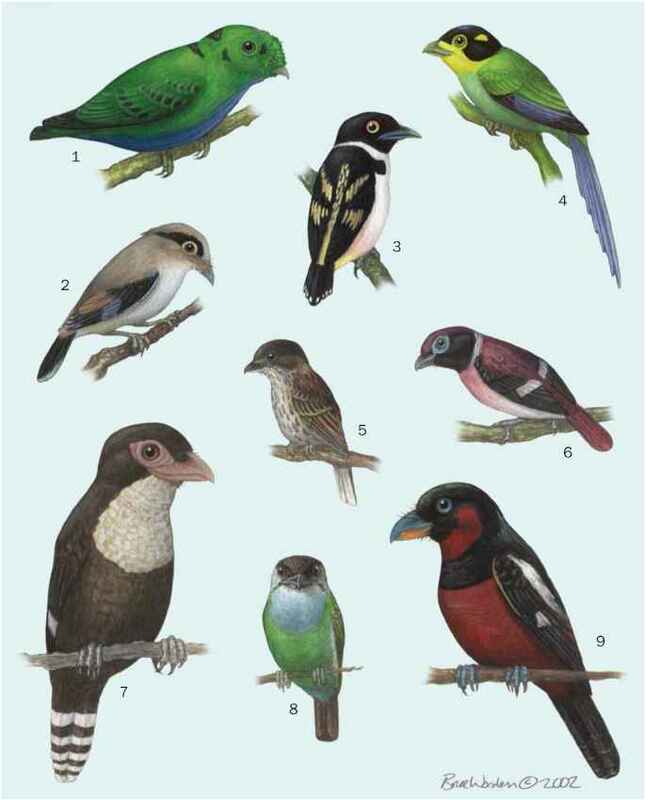 The clade is closest allied to the mountain toucans (Andigena). French: Toucan toco; German: Riesentukan; Spanish: Tucán Toco. The largest of all toucans. Length about 24 in (60 cm). Weight 26.8 oz (760 g) male; 20.7 oz (587 g) female. The only Ramphastos species with a predominately black-and-white body (other species in this group may have orange, orange-red, or yellow on the breast or throat). Enormous orange bill with black spot at the tip is unmistakable. This species ranges from the mouth of the Amazon River southward to southern Brazil and northern Argentina. This species inhabits more macrohabitats than any other toucan and is the species most likely to be seen in open and semi-open habitat. 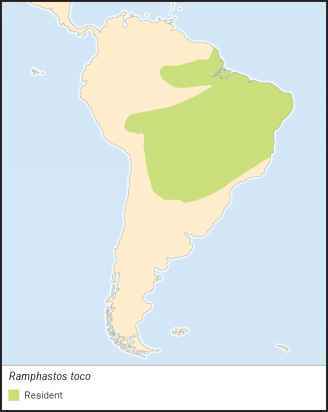 For example, it may be found in tropical forest, Chiquitano forest, pantanal, seasonal inundated savanna, and secondary vegetation. A lowland species, the toco toucan ranges up to 3,900 ft (1,200 m) in altitude. Of all the toucans, this is the species most likely to be seen in flight over rivers and across open areas; often perches high in trees, on dead branches. Flap-glide flight is slow and undulating. The call is perhaps the lowest in pitch of all toucans; has been compared to snoring or the croaking of a toad. Often rattles bill or raps tongue against closed bill. May feed alone, with a mate, or in a small flock of up to nine birds. Very agile and often hangs head down to reach a fruit or probe a crevice. Typically feeds in the canopy, but unusual among toucans in sometimes alighting on the ground to take fallen fruits. Eats a variety of fruits plus arthropods and has been seen hunting cooperatively for eggs and nestlings in nesting colonies of yellow-rumped caciques. days; nestlings are feed insects initially, then diet becomes mostly fruit. Young birds fledge at 43 to 52 days. Not threatened. May be expanding its range into newly cleared areas in Amazonia.